NVIDIA promised a 5.1 update for the Shield tablet would hit devices this month, and it looks like the company is making good. We've got numerous tips that say the update is available right now on the WiFi tablet. Head to the settings and grab it at your earliest convenience. NVIDIA lists the changes in the 200MB update as follows. Enhanced security, including support for Android for Work. Improved quick-settings menu, profile management etc. Enabled Global Tone Mapping feature. This feature can be toggled by the user. Improved pairing experience and other optimizations. 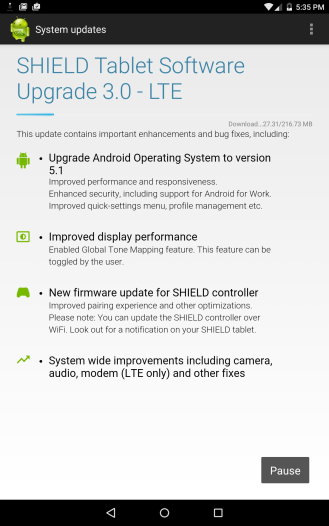 Please note: You can update the SHIELD controller over WiFi. 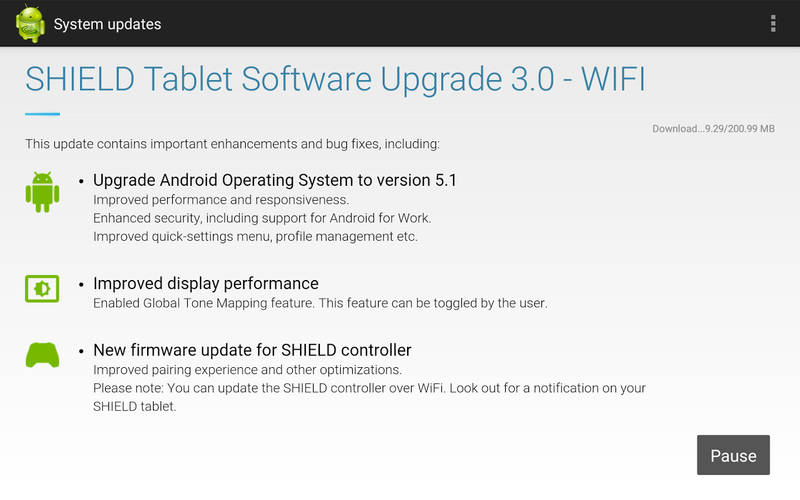 Look out for a notification on your SHIELD tablet. You probably know by now what Android 5.1 is all about. It makes a few UI tweaks, improves how notifications are handled, and patches some bugs. The new global tone mapping is unique to the Shield Tablet. It will be interesting to see if that does anything for the device's generally average screen. The LTE version of the tablet sometimes lags a few days behind the WiFi variant with updates, so expect that to hit anytime between now and the middle of next week. Looks like the LTE update is out now too. That's a pleasant surprise. Thanks to XDA-Developers poster gavin-phelan, we now have direct links for the full ROM files for all SHIELD Tablet variants. You should be able to manually apply these files in a custom recovery - especially handy if you've rooted your tablet, and are therefore ineligable for post-Android 5.0 OTA updates. According to commenters, the Wi-Fi version of the tablet uses the same ROM no matter what country you're in.